The nursery has been established in its current location for over 15 years. Miss Gemma has owned the setting since 2009 . Miss Gemma has been a Montessori teacher since 2000 working in various nurseries before setting up Little Gems Montessori. She is a passionate Montessorian wanting all children to experience the freedom of movement and choice offered by a Montessori environment and achieve the best possible start to their development. Both of her children attended Little Gems and have successfully settled into primary school. To provide outstanding care for young children within a Montessori environment. For the first experience of nursery school to be fun and exciting for all children. As mothers ourselves we never underestimate the trust you place in us when putting your child in our care. 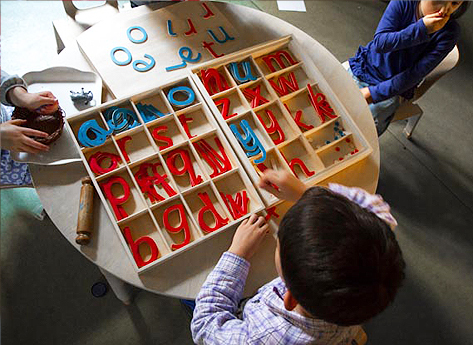 The Montessori method of education was developed by Maria Montessori in Italy at the turn of the 19th Century. Now over 100 years after she founded her first school, her methods are widely regarded as being some of the most effective forms of education, and have been adopted into the mainstream system. The Montessori philosophy is based on the concepts of allowing children to develop at their own pace, and to experience events, rather than being told of them. This idea of learning through experience has been adopted through the whole of the educational system. Montessori classrooms provide a prepared environment where children are free to respond to their natural drive to work and learn. The children's inherent love of learning is encouraged by giving them opportunities to engage in spontaneous, meaningful activities under the guidance of a trained adult. Through their work, the children develop concentration, motivation, persistence, and discipline. Within this framework of order, during the crucial years of development, children progress at their own pace and rhythm, according to their individual capabilities. 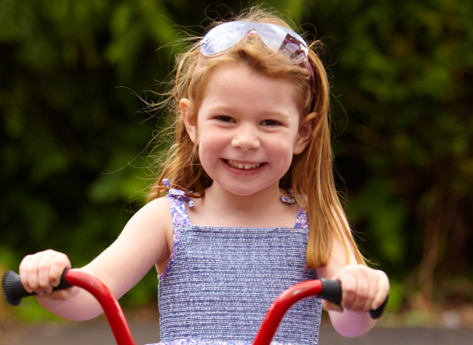 Our curriculum areas at Little Gems Montessori cover all areas of the Montessori learning combined with the revised 2012: Early Years Foundation Stage. These areas include Practical Life, Sensorial, Communication and Language, Maths, Cultural and Environmental Studies, and Expressive Arts and Design. 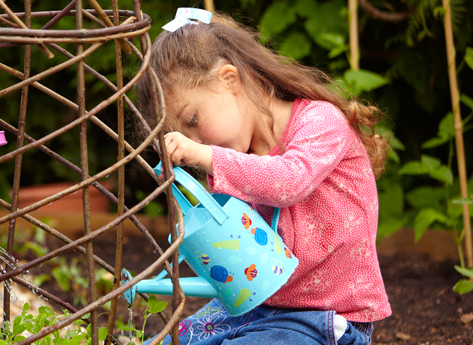 Simple exercises that allow the children to develop key life skills and encourage co-ordination and concentration through care of self and care of the environment. A rich variety of activities and materials that attracts the child and helps him to explore and continually extend his understanding and knowledge through his senses (touch, sight, sound, smell, and stereognostic sense.) a multi-sensory experience. Multi-faceted approaches to the positive development of interpersonal and social skills are of primary concern to us. Opportunities are provided for daily interaction fostering co-operation and empathy with their peers and the nurturing of self-esteem, confidence and independence are given the highest priority. 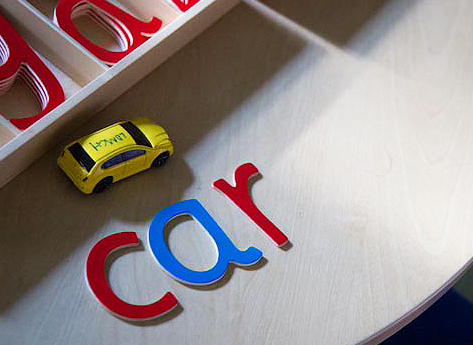 An indirect approach is used to facilitate reading, writing, social and comprehension skills. We have a book corner and a wealth of storytelling, news talks and conversation. 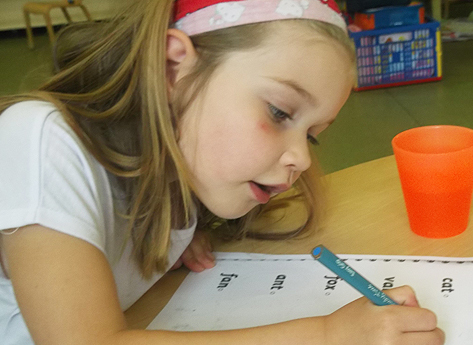 Indirect and direct route into reading are introduced through a 'phonic' approach. 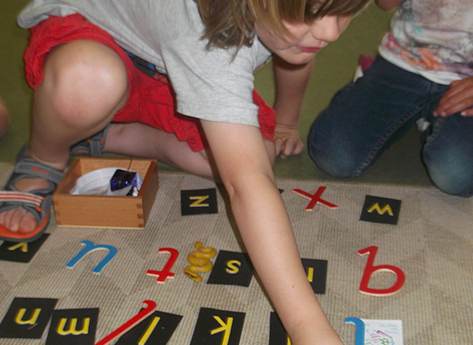 The children are taught the alphabet phonetically, leading onto the Montessori moveable alphabet with simple word building, and if and when they are ready, encouraged to read. Children are be given access to a wide range of reading materials (books, poems, and other written materials) to ignite their interest. By means of adult supported practical experience, the development of number concepts and mathematical operations facilitates their developing mathematical understanding to solve practical problems, and use the vocabulary of mathematics. The development of number concepts and mathematical operations. In both language and maths our Montessori environment is richly endowed and greatly exceeds the expectations of the National Curriculum. Our environment works on the continual development of the child's physical body as he or she has freedom of movement for both gross and fine motor skills. We have wonderful facilities both inside and outside in our lovely garden for children to enjoy and maximize their physical development. A safe and stimulating environment allows the children to explore and experiment with a range of natural and manufactured materials. They learn to observe the features of objects and substances, recognising differences, patterns and similarities and to share and record their findings. A range of safe and well maintained equipment enables the children to extend their technological understanding using simple tools and techniques as appropriate to achieve their intentions and to solve problems. Art equipment provides for open-ended exploration with emphasis on free expression of colour shape and texture and the development of skills in painting, drawing and collage. Children are encouraged to use these resources to construct their individual ideas in two and three dimensions. Children join in with and respond to music and stories, and there are many opportunities for imaginative role play. 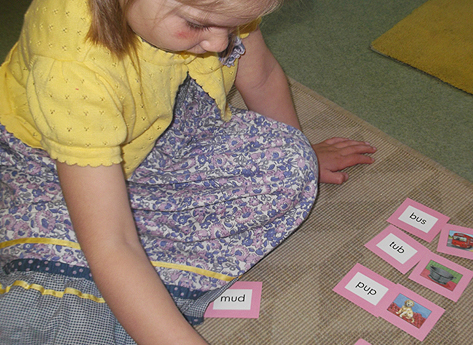 Alongside the Montessori Method we implement the Early Years Foundation Stage which has four themes. A Unique Child, Positive Relationships, Enabling Environments and Learning and Development. 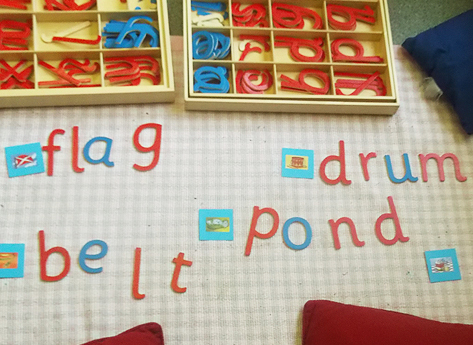 These themes work together to underpin the effective practice in the delivery of the EYFS. Positive Relationships - Children learn to be strong and independent from a base of loving and secure relationships with parents and a key person. Upon receipt of the registration form, your child's name is placed on our waiting list. • Children on waiting list in order of receipt of registration form. When a place has been offered this can be secured by payment of a deposit of £150 (This deposit is held until we are given a full terms notice and will then be repaid in full) We require that children aged 2years attend at least 2 sessions at the nursery to help settle them into a quieter environment, once they are 2years and 6 months they can attend at least 3 morning sessions. When they reach 3years we require them to attend at least 4 morning sessions. However if they are in their final year with us and are over 3years we require them to do at least 4 morning and 1 afternoon session. This will enable each child to access our full range of Montessori equipment and to reach their full potential before moving on to school. Click here for a registration form (PDF), which should be printed, completed and returned with the required fees. Our fees are payable by the first day of term, ideally by BACS. Please contact us for details of our current fee structure. This is a funded scheme introduced by the Government for children over 3 (eligible from the term after they turn 3). It provides free entitlement to five sessions of three hours a week (total of 15hours) for up to 38 weeks a year. Any extra time will be charged for accordingly. We also offer places for 30 hours funding for those who are eligible. 10% discount for the second child and each additional child. Afternoon sessions are from 12.30pm until 3.30 pm. Children can stay for lunch on Monday - Friday until 1.30pm. We are open term time only for 38 weeks of the year and run additional holiday clubs during Christmas, Easter and Summer holidays.